MIEL’s mission to “publish difficult, innovative, intelligent, and deeply felt writing” is at the fore of two of the first three chapbooks from the new publisher. 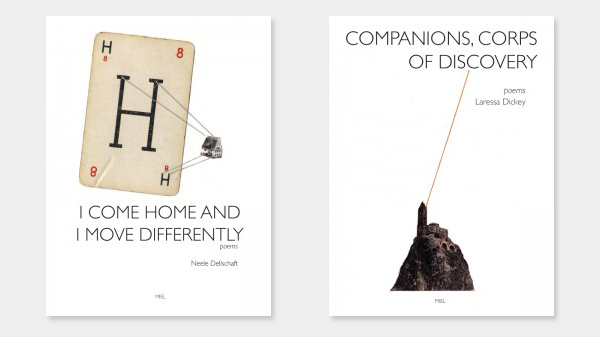 Published in March, both Companions, Corps of Discovery by Laressa Dickey and I Come Home and I Move Differently by Neele Dellschaft are challenging, lovely little books. Each is hand-bound and a limited-edition printing (the first printing is signed by the author), so they are as much art-object as book. The speaker knows she hasn’t seen all seven billion parts of life, but she has seen much—in travel, in museums—the world is, to her, a lab. At the end of the day, she comes home and moves differently because her orbit has been altered by what she has seen, the way history alters a place, and culture. Companions, Corps of Discovery is one of four chapbooks by Laressa Dickey that MIEL is publishing this year. Another, A Pictorial History of Wilderness, was also released last month, and two more are forthcoming in September. Unlike Dellschaft’s work, Dickey’s writing is fragmented and more difficult to follow. Lines interrupt other lines, and whole poems seem to interrupt each other. Since none of the poems are titled, it’s difficult to tell where or whether poems end. The reader is forced to read closely in order to pick out distinct themes and images, and to compartmentalize parts of the book from one another. The chapbook form suits the poems in this collection. It’s enough to get a sense of how the poems work in tandem, but small enough to be read and digested in one sitting without being overwhelming. Travel and memory are as present in Companions as they are in Dellschaft’s I Come Home, though Dickey is much more metaphysical in her treatment of these themes. In one poem she writes, “I wore white stockings // I wore / my grandmother’s legs[. ]” Instead of observing or being altered by history, Dickey prefers to put it on, to wear it and discover for herself what there is in the past. These two chapbooks are a bold first offering from MIEL. Each is distinct in style, but they offer a common global view of the world, albeit one that is distinctly Western. I look forward to Dickey’s two forthcoming chapbooks, and the other projects MIEL has in store. They’ll certainly be lovely to look at, and they’ll certainly be rewarding reading experiences, from the moment your package comes in the mail, to the moment you’ve put the book down.